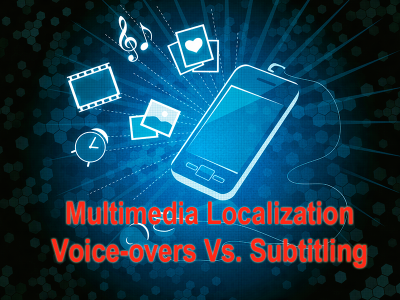 Last week we gave A Brief Overview of Multimedia Localization, and this week we’re going to dive a little deeper to explore using voice-over versus subtitling for the audio in your multimedia projects. When planning a multimedia localization project, what to do with the audio can be tricky. Should it be localized using voice-over or subtitles? There are pros and cons to using both voice-overs and subtitles. Keep reading for an exploration of those pros and cons. Before we begin comparing voice-overs to subtitling, it is important to know what are the steps involved with multimedia localization projects. Remember, a typical multimedia localization lifecycle is roughly 3-4 weeks per hour of audio/video production. Here are the general steps involved with both voice-over and subtitling projects. Will you provide the script to the localization team? Does the localization team need to verify the script, or can they assume it is final? Will you perform an in-country linguistic review of the script? The transcribed script is translated following the preferences and culture of the target market. Translation is central to any multimedia localization project. Any localization project is only as good as the translation and cultural adaptation it is based on. Make sure that you use the most qualified translators with knowledge not just of the target language, but also the subject matter. During this phase you adjust the video translation before dubbing to account for timing. Insert time codes, arrange lines by roles and match the translated text with the original timing. Dub the sound track using professional voice talent: announcers, actors, etc. In voice-over there is an audio recording made by voice talent that is then checked for quality by a linguist. The linguist will compare the audio to the written script to ensure that everything was captured and recorded as intended. Build a menu and package the final localized multimedia product so that it all works together. Now, here are some other important questions to answer when it comes to multimedia localization audio. Does The Audio Need To Be Synced To A Video? When working with audio, the type of multimedia localization project is important. The type of project dictates the flexibility you have with the audio involved. It also dictates whether or not the audio needs to be timed. Video is usually a set length of time, and you typically cannot change the length of the video. In this case there must be a timed script and timed audio. This is because the audio must match the length and specific moments in the video. If the multimedia project involves animation, slides or eLearning, then you can play with the timing. For eLearning, animation or slides having timed audio and a timed script is not as important. In eLearning you may not need to time the audio, because the localized course can allow for expansion more easily. You can sync slides, eLearning or animation to audio, whereas with video you must sync the audio to the video. However, because of this the audio time involved in the project can be more than quoted. Who Will Perform The Video Editing And How Does The Editor Want The Audio File? Do you want to edit the multimedia localization project yourself or have an outside localization team take care of this? No matter who performs the editing, you will want to know how the editor wants the audio file. The audio file may be submitted as one audio file per slide or segment or in one comprehensive audio file. When using voice-over to localize your multimedia project there are many considerations. For example you must select the voice talent. How many voice talents are needed for recording? Male/Female? With voice-over, the more voices used, the more expensive the project. You may consider trying to use one voice or one voice for all male roles and one for all female parts if you must keep costs down. There is typically a minimum fee for all voice talents, and pricing is by the minute along with a minimum charge per talent. When subtitling, the subtitles are created by a video editor and then checked for quality by a linguist. The linguist reads all the subtitles and makes sure that all the words are there and correct. Subtitling may be performed by a speaker of any language so long as it is checked by a linguist at the end when the final project is put together. However, it is helpful to have the editor be fluent in the target language. This is something you will want to work out with your localization team before the project begins. Subtitling may be done using special software or it may be manually added to the video. Using software, there is typically more file prep time, but then you are able to quickly add the subtitles to the video all at once. Using the software you put the timecode on the string in an Excel file when translating. Each time unit can only take so many characters. Then you would import the excel file into the video application. Adding subtitles manually typically takes more video editing time. As a rule of thumb, if the project is short you should add the subtitles manually; if the project is longer then use the subtitling software. At the beginning of a localization project, audio is often an unknown, which makes most multimedia localization quotes estimates rather than firm numbers. It is important to note that whereas transcription and subtitling are paid hourly, voice-over is traditionally paid by the minute. In general, voice-over is typically more expensive than subtitling. Subtitling is more cost effective than voice-overs, but sometimes there is a lot to read. Usually projects that use audio are much more effective. If the project involves a “talking head,” then subtitling is ok to use. If the project involves instructions showing how to do something, then it is usually better to use voice-over. No matter if you use subtitling or voice-over for your multimedia projects, having them localized allows you to see immediate results when it comes to international and multilingual audiences. You may try using both and seeing what solution works best for you. A lot of it depends on what the final multimedia project will be used for, the audience and the budget allocated. What results have you seen with localized multimedia using voice-overs versus subtitling? Please share your experiences in our comments section. Also please like and share this blog socially.